You are here: Home ∼ 2010 ∼ March ∼ 02 ∼ Aquaphor: The Wonder Goop! Very soft hands down, the BEST beauty product ever. That is why I picked it for my first post. If you have been cursed with dry or sensitive skin, you NEED this moisturizer! I use it from head to toe… literally. It’s uses are… get ready for it… heals dry heels, elbows, knees, hands… anywhere you may need serious care. It moisturizes lips and adds a subtle shine, tames flyaways and stray eyebrows and it’s even gentle enough to use on your pretty face. Mix a little with your regular night cream for a gorgeous glow come morning. 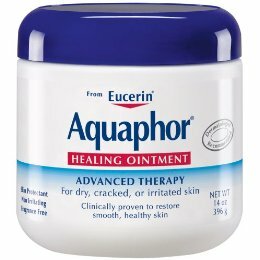 I think my favorite use for Aquaphor may be as a cuticle cream. Mom’s will love it, too! It’s great for babies tender skin. It is often used to heal and prevent diaper rash. It is wonderful for athletes and can be a real life saver on the ski slopes during those cold winter months. And if you have eczema, Aquaphor WILL save your life! You can purchase Aquaphor at most drug stores including Target. It is available in a 1.75 oz tube, 3.5 oz and 14 oz jars and a 0.35 oz on-the-go dual pack. Aquaphor is recommended by dermatologists and pediatricians… and me! Trust me! You will be OBSESSED with it! I love this product! Its Great for hands and bottom of feet! Hmmm…..I have used Eucerin products in the past and find them to be quite greasy but they are good. Living in Chicago, the combination of winter cold and indoor heat makes for pretty harcore dry skin and my favorite product to cure my dry skin issues is Mango body butter by body shop – amazing product that smells amazing! Yes, Scarlett. The greasiness does tend to bother people a bit. It’s understandable. But, once you kind of get past that, it’s incredible. I had some serious dry skin on my face, like flaking, so I use it at night and I haven’t had a problem since I started. You are soooo right about the Mango body butter. I actually have that on my list to blog about. It smells HEAVENLY! Like I want to eat it!